Johanna of the Passionate Cook was very enthusiastically encouraging us to create one of the more lusciously delicious concoctions man has ever created - chocolate truffles. I've always wanted to make one of these little pieces of delight. The sheer sensation of creamy melting chocolate in my mouth sealed my decision to participate in this 25th edition of the SHF. 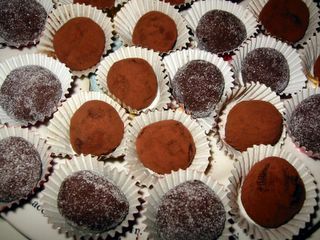 I wanted to create truffles that my kids would want to eat. So bitter chocolate is out while a little bit of sugar is in. This recipe I adapted from Phil Vickery's A Passion for Puddings cookbook was a little bit unusual since it uses condensed milk. I was a bit skeptical if it will be as meltingly luscious as ones made with double creams but it did convincingly deliver. The orange liquor had to be replaced with just normal orange extract for my kids' sake and although I didn't have any orange zest it was orangy enough to our taste. The ultimate taste was whether my kids will eat it. Well, as of this time they have eaten one each and reached for more. They naturally gravitated for ones rolled in vanilla sugar so I'll definitely remember that next time I make more of these moreish cloud of chocolate heaven. Melt chocolate, double cream, and condensed milk in a heatproof bowl over simmering water in a saucepan. Mix in the orange liqueur or orange extract and zest (if using). Remove from heat and cool completely to room temperature. Cover and chill in the fridge for about 4 hours or overnight. 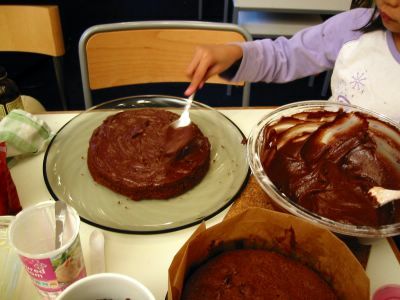 Spread cocoa powder or sugar on a wide plate. Have a bowl of iced water in your working area. Using a teaspoon, scoop a teaspoonful of the chocolate mixture and shape into balls using your hands then roll on the cocoa powder or sugar. 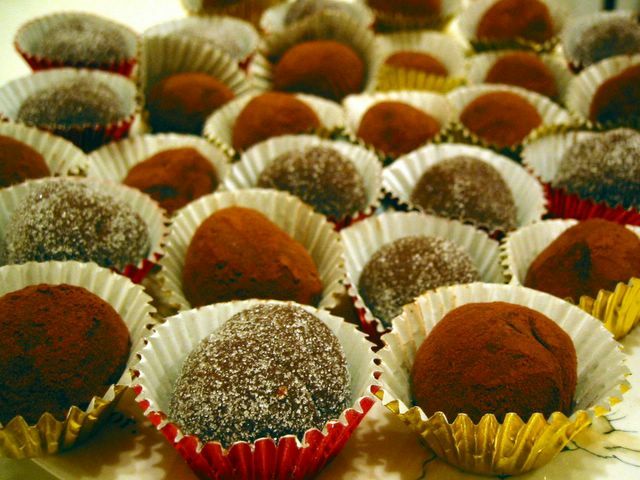 Repeat until you have used up all the truffle mixture. Dip your hands from time to time in the iced water to cool it down and prevent the melting of the truffles while you're rolling it. I miss the old IMBB food blogging event. I liked the idea of setting a theme and have bloggers submit entries ranging from starter to mains to desserts or even cocktails. Unfortunately it seems to have ceased operation and there seems to be no regeneration in sight. 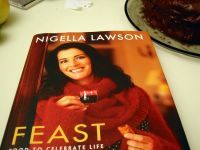 Blogging events challenge me to seek out new recipes or new ingredients which I would not normally cook. For me, that's the main draw other than the excitement of looking at the rest of the entries come roundup time. The range and variety of the entries usually sparks an idea or makes me want to try a few. I've seen the Weekend Cookbook blogging event quite sometime now (usually hosted and originally conceived by Sara of I Like To Cook). And I've filed away at the back of my mind a reminder to participate when time permits me. Sadly it's only now that I had a chance to write up an entry. No party is complete without a cake, isn't it? 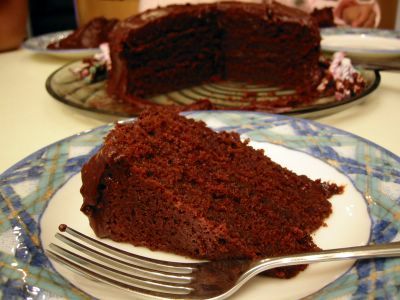 What better way than having a good 'ol chocolate cake - nothing fancy, no exotic ingredient from a far flung land - just your standard reliable yummy birthday cake. In the time honored tradition of my baking sojourns I made a mistake - as usual. The recipe called for 1 1/2 sticks butter but somehow in the confusion and mayhem in the kitchen I put in 1 1/2 cups! That's double the amount! I was quietly fuming why this cookbook had sticks measurements. Then I remembered it was given to me by a blogging friend in America. Duh! Thank goodness it did not ruin the cake. Actually it made it extra moist which made me wonder how it would turn out with half the butter. We all loved the cake but the icing was too sweet for us. So I might hunt for other icing recipes out there or reduce the sugar though my youngest had a great time slathering it on, between, and around the cake layers. Preheat oven to 350°F/180°C/fan 160°C. Grease and line 2 x 8-inch/20cm round sandwich pans. In a bowl, sift flour, cocoa, baking powder, and bicarbonate of soda. Set aside. In another bowl, beat the butter and sugar until light and fluffy. Add in the eggs one at a time, mix well after each addition. Add the sour cream and vanilla, combine well. Stir in the flour mixture with a wooden spoon until well combined. Divide the batter between the 2 prepared cake pans and bake for 25-30 minutes. Remove from oven and cool for about 10 minutes. Loosen and take out from the pans. Cool completely. For the icing: Melt the chocolate in a heat-proof bowl over simmering water. Cool completely. Beat the all the ingredients together until well combined. To assemble: Put one of the cakes on a cake plate. Evenly spread some of the icing on it and then top with the other cake layer. Spread and swirl decoratively the rest of the icing all around the layered cakes. Waste not want not - the recycling mantra. When you don't have much resources (aka money) you think of lots of ways to save. That includes recycling clothes, everyday things, and most of all food. Recycling is more or less a way of life in the Philippines. You just don't throw things away. Things have to be re-used until they've broken down to pieces or if it's of no use to anyone. As for food, you don't let it spoil either by eating it all or recycling it. It takes some imagination and skill to successfully do the latter while making the food remain edible and tasty. The current edition 15th edition of Lasang Pinoy (hosted by Mike of Lafang) hopefully will showcase all the wonderful ways of recycling food. This recipe is exactly how my mother made them except I patted it down in a baking pan and cut them into bars. But you really don't have to do it that way you can always start eating it as soon as it got off from the wok - just like we did. We somehow prefer it warm with that sweet caramelly flavour of the reduced evaporated milk and sugar. My mother emphasised that I put in a pinch of salt to blend in with the toffee-like flavour. So don't forget that if you're ever going to make this. My first try after about 20 years has not been a complete success. I had too much sauce and too little ampaw which explains the wet appearance in the picture. I'll make sure to dry more rice before doing this! You need the rice pot where you've just cooked rice and had some left overs or tutong (crust of rice at the bottom). Fill up the pot with water *do not put soap! * and soak until all the rice is soft and separated. Drain the rice from the pot and spread on a bilao (Filipino winnowing basket) or any similar container. Leave it out in direct sunlight to dry until the grains are hard and brittle. 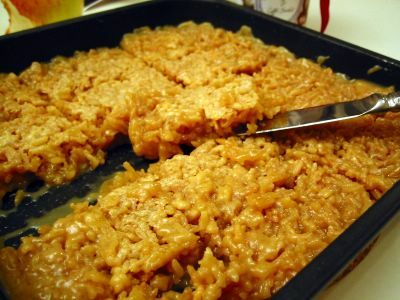 Spread the drained rice on a baking sheet and put in a 150C/fan 130C/300F preheated oven. Let it dry there for about 30 minutes or until completely dry and brittle. Heat oil in a wok or saucepan until quite hot. Drop a piece of dried rice to test it - it should puff up right away. 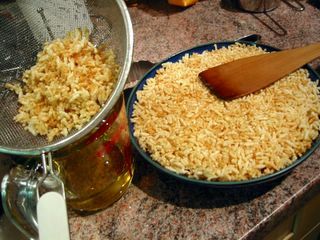 Fry the dried rice about a fistful at a time and be prepared to scoop it out after only a few seconds. It burns easily so don't let it hang around floating there in the hot oil. One thing I do is once it all puffs up I take the wok off the heat so that the heat would be reduced while I'm busy scooping it out and prevent it from burning. Repeat until all the rice is puffed. In another wok, tip in the evaporated milk, sugar and pinch of salt. Bring to boil then turn down heat and simmer while constantly stirring until slightly thick. Turn off heat and put in all the ampaw in the wok and stir until sauce and ampaw are well mixed. Put in a non-stick or greased baking pan and pat it down level. Cool slightly and then cut into bars or squares. Cool completely.